Before you love anyone, you need to love yourself and only then can you do justice to the relationship. Additionally, only when you consider your self-worth and respect your own self that anyone else will respect you. 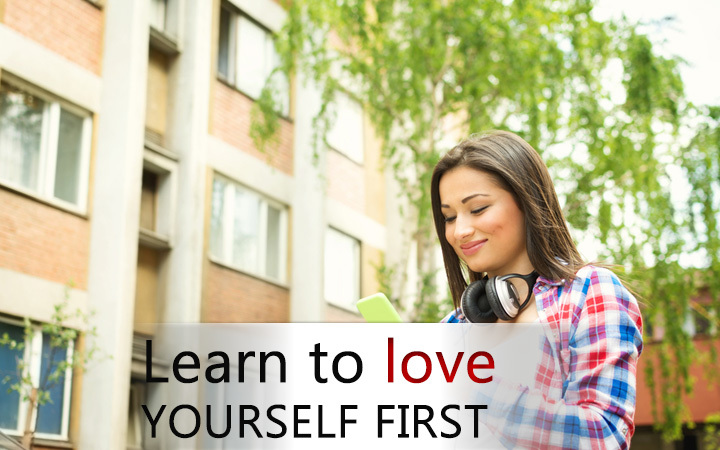 Thus, it is essential to learn to love yourself first. Just like you show your love for others, similarly you need to show some love towards your own self. Most of the times you must be looking at your own faults and considering what to change about yourself that you forget that you are a beautiful human being that has a lot of positive traits. It is important to see in print all of the positive traits that you have. From having leadership qualities to being a true friend, count in everything. Ponder over your physical and emotional positive traits that you have. Put everything on the list and put it up prominently. Ask your friends and family to enumerate your positive and good traits that they like and add to the list. Not only will you help you know more about yourself but it boosts your self-confidence and enhances your self-worth. It is best to consider your own self as your best friend. You don’t have to blurt out all your secrets to everyone but keep some to yourself. Just like you talk with your friend and challenge them when they are making a bad decision, you will need to challenge yourself. Remind yourself of your potential over and over again. Don’t be a doormat. Put your needs and requirements in focus. It is good to be giving and supportive but you need the pampering and love. Whether it is about paying attention to yourself at work or in personal relationships, you need to do it. It is not being selfish. When you love yourself, you protect your heart and don’t let anyone take advantage of your good nature. Don’t be desperate for love and be willing to go to any extent to safeguard your relationship, even if it is abusive.Stay safe. Think about your needs, self-respect and interests.